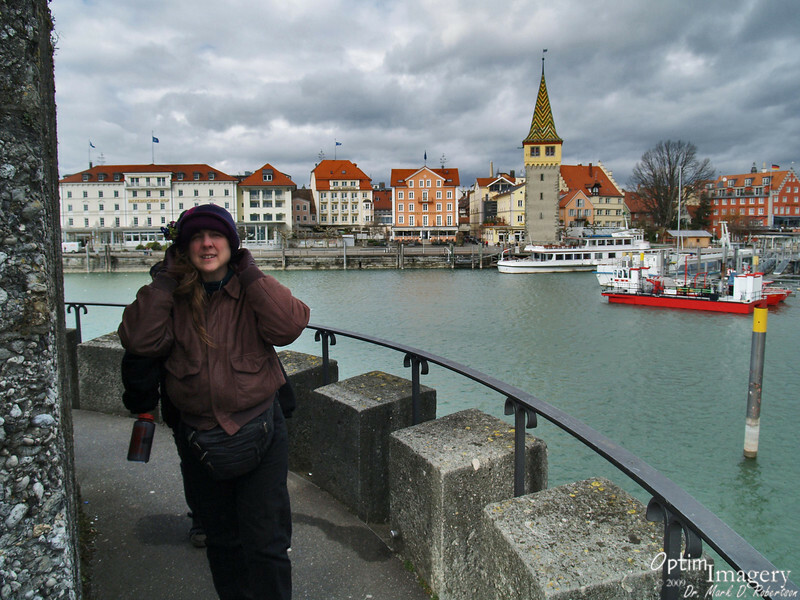 Looking back across the Harbor to the Mangturm and Lindau. The term Mangturm comes from Mangle house, which (I believe) refers to a business selling cloth (all references I can find refer to it as "a cloth house," but given the context, I think it means a place which sells cloth, as a "pancake house" sells pancakes and a "coffee house" sells coffee. I may be wrong: It may mean a house made of cloth, perhaps like a tent. I remember being so disappointed first time I went to a pancake house and saw that it was made of bricks. And I could not imagine how they could get a coffee house to do anything but form a puddle.). Originally there was a Mangle house adjoining the tower. Anyone know for sure whether a mangle house is a place which sells or is a structure made out of cloth?